As 2017 rolls along, how are your New Year’s resolutions going? Honestly, my spouse and I continue to work on ours, including our personal budget goals! If military orders come up, a big factor in our search for a house would be what we could afford. Like many other military families, we’d be looking for the most bang for our BAH buck. If we’d be assigned to Wright-Patterson Air Force Base, the cards may be in our favor! Take a peek at these two delightful and affordable Ohio homes currently listed on MilitaryByOwner, both priced around $200,000. Swiss Chalet style in the Buckeye state! This home is no longer listed. See current MilitaryByOwner listings near WPAFB. Each summer, the first Friday of the month is celebrated with music, art, and retail in the historic downtown area of Xenia, Ohio. Tucked halfway between Columbus and Cincinnati, the community of Xenia is a short 14-mile drive from Wright-Patterson Air Force Base. Nestled along a quiet Xenia street is this charming 2,200-square-foot Swiss chalet style home. 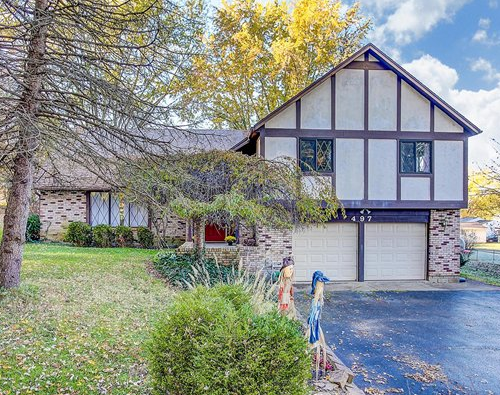 With 4 bedrooms and 2½ bathrooms, this Ohio abode has plenty of room for each kiddo in a busy family. Additionally, the 2-bay garage and premium paved driveway offer a good deal of storage and parking. One step through the cheery red front door and it’s easy to see this house has been well taken care of. Walnut wood trim edges hardwood floors. Island beige tile flows through the custom eat-in kitchen. 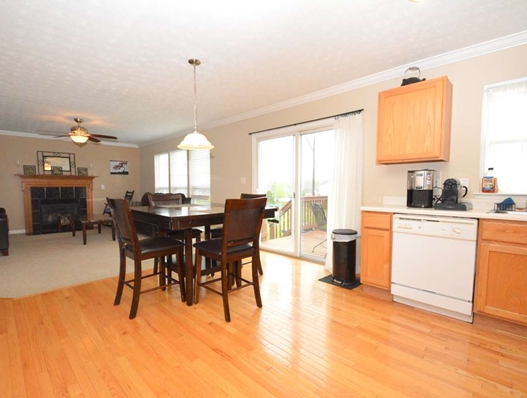 A sun-filled dining room leads to a covered back patio and spacious yard with multi-use shed. When the kids return from local YMCA activities, gather for a family bike ride. Enjoy the scenic woods and peaceful fields along the fantastic network of bicycle trails. 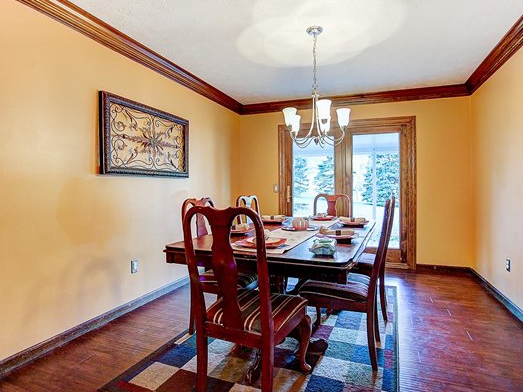 Make the most of your time in the Buckeye state with this Ohio home! Lush landscaping surrounds this Ohio nest! Named after natural springs found in the area, Springboro, Ohio is filled to the brim with pristine parks, manicured lawns, and colorful flowerbeds. Flourishing gardens fill Ohio farmers' markets from Springboro on up the 25 miles to Dayton and Wright-Patterson AFB. 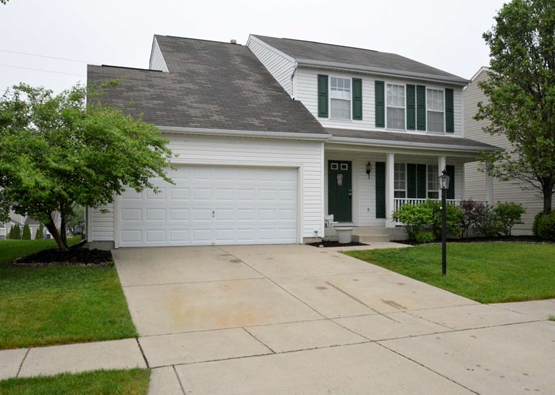 Needless to say, this 3-bedroom, 2½-bathroom Springboro estate has impeccable landscaping with the yard leading to an expansive neighborhood common. The open concept feel of this 2,100-square-foot home welcomes large family gatherings, soccer team celebrations, or a military spouse social. The oak wood flooring pairs well with matching blonde cabinetry and crisp white counters in this spacious eat-in kitchen. In the winter months, cozy up by the elegant fireplace of the adjoining hearth room. Come summer, unwind on the back deck with access from the dining area. With free admission to the National Museum of the U.S. Air Force, kids of all ages can spend the day in Dayton, touring the grand exhibits. Or, for further history lessons, quality time could be spent at the National Underground Railroad Freedom Center in Cincinnati. Being centrally located, it’s easy to travel to all sorts of destinations from this pleasing Ohio property! For around $200k, both of these homes have over 2,000 square feet of living space and generous backyards. This is good news for a budget-conscious military family like ours! For more tips on making a good investment in today’s housing market, follow MilitaryByOwner on Facebook, Twitter, LinkedIn, and YouTube.